The right uniform can make a difference in employee safety in any industry, as it is worn to maintain a clean and professional appearance while also promoting the brand of a business. While many uniforms are used as marketing tools, others are a crucial measure of workplace safety for employees in certain industries such as construction, law enforcement, and engineering. If you are looking to invest in new uniforms for your employees this year, consider these three essential functions that a well-maintained uniform will provide for your employees. Employees who work around construction sites or manufacturing plants need an added barrier of protection from debris and hazardous chemicals. In providing protective uniforms for employees, your business is upholding a responsibility of workplace safety standards for your team to fulfill the tasks of their job safely. If your employees are left without a protective uniform as they are working, they would be at an especially high risk for personal injury on the job. For employees working in hospitals, restaurants, or other client-facing jobs, the uniform is a measure of cleanliness for the service that you are providing that may involve food, chemicals, or infectious disease. With these industries, a well-maintained uniform is both a safety measure against hazardous materials and a standard of personal hygiene for each employee. Maintenance and cleaning of these uniforms can sometimes require extra care, such as special cleaning products or separation for washing. Employees working in law enforcement or construction are often at risk while working in high traffic areas such as busy highways and construction sites. 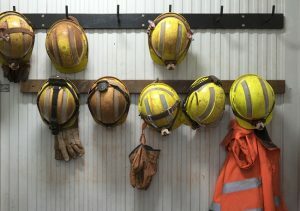 For jobs in these industries especially, these employee uniforms are particularly important to employee safety on the job because they make these employees more visible on the job as they work. An example of this is the use of reflective vests on highway construction sites as a means of identifying these workers in the dark or in a busy environment such as a highway. This entry was posted on Thursday, May 3rd, 2018	at 3:33 pm	. You can follow any responses to this entry through the RSS 2.0	feed. Both comments and pings are currently closed.